It’s amazing how a simple, friendly, non-threatening little TV/print campaign can change public opinion about something as controversial as nuclear power. 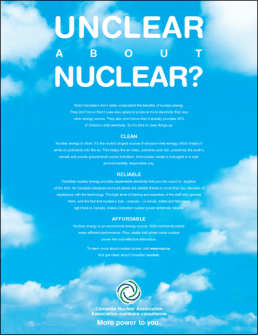 Within four months, positive acceptance of the word “nuclear” was up 14 points, and 65% of Ontarians recalled seeing the commercial. This gave politicians the confidence they needed to discuss nuclear power with the media.